In many plants today, the number of “in house” maintenance personnel are reducing at alarming rates, making it even more critical that routine and unexpected maintenance be handled in the most efficient manner. French works very closely with all of our customers to help reduce and make for the most efficient use of their maintenance time. We have provided numerous new sub-assemblies for French equipment that have helped to increase up time. These sub-assemblies can consist of a very small part or a large sub-assembly of a machine. The main idea is to have the long-lead time components of your machine ready for quick and easy replacement. Numerous French customers have reported saving days by having available a critical sub-assembly which may be used to get a machine up and running quickly with very little disruption in their production time. Another important benefit to our customers of having key sub-assemblies available is that once the new sub-assembly is installed, the removed assembly can then be repaired under less stressful times, and kept on hand and ready for the next scheduled installation. 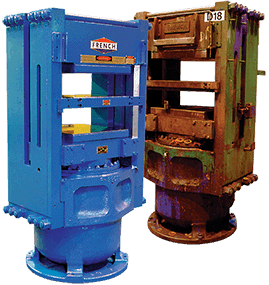 Contact us today to learn more about our hydraulic press repair services and sub-assembly capabilities. French has become the number one source for many processors who benefit from our commitment to quick repair turnaround and quality repair work.